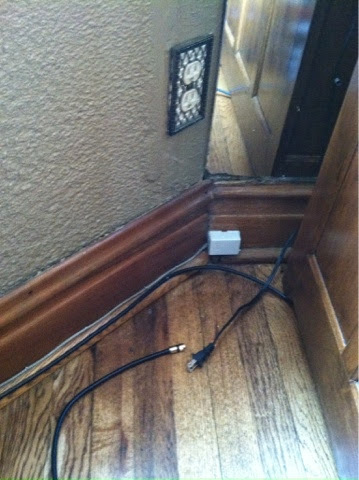 Sometimes patience is a virtual or at least a godsend: when we moved the bookcase the other day, I found this outlet along with the cable feed. The previous owner had done a decent job of running cable throughout the house for his DirecTV and when we got cable, we simply piggybacked on that. I had forgotten all about this cable, along with the power outlet that obviously has been hidden behind the bookcase for over a year. I was wondering what to do about moving the computer down from the office to the parlor and how I would reconfigure the Internet through the house. While this doesn't necessarily solve everything, it gives me more options. Right now the Internet originates in our attic and bring it down via wifi repeaters and a LAN cable from the attic to the office. If I can switch it to our parlor and run LAN cables through the basement, it will be much easier to hardwire future devices like security cameras and smart tvs. When it was Mysteries of Life 1.0: On an older blog I wrote about a concept in life that I noticed. It seems like there is always something big on your radar. Maybe you're a student and finals are coming up. Or you have a deadline at work on some huge project. Or in your personal life you wonder how you're gonna tell someone that you have to break up. Whatever it is, it sometimes seems like there's something that is taking up all your attention, energy and resources. I called this the Crisis Of the Week, or COW for short. It may not be earth shattering or life threatening, but it generally consumes 80% of your attention. It may not even be a week's length of time. I guess there could be the Crisis of the Day or COD. Or it could be longer, like Crisis of the Month. I guess there could even be a Crisis of the Year or COY. Lot's of possibilities. Then the thing passes. Finals come and go. The deadline arrives and then ends. The breakup occurs. Maybe things were a disaster or maybe they weren't as bad as they seemed. Whatever happened, the next thing you know, there's a new new thing on your radar to replace the thing that passed. But if you think about it carefully, there's a small slice of time in-between when nothing is really happening. We may not notice it because we're still thinking "I can't believe [whatever was stressing us out] is over, but it's there. Right now I would really like to be in that in-between phase. Unfortunately, there are things afoot that we are dealing with that prevent me from simply exhaling and enjoying the summer weather that seems to have finally arrived. For more details on those issues, click here. Otherwise, enjoy the nice weather. 45th Birthday and we are having twins!